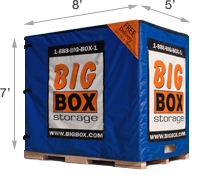 Serving all of El Cajon (as well as all of East County), Big Box Storage provides convenient portable storage services. Need storage space in El Cajon? 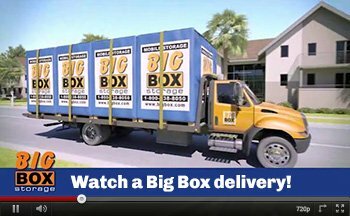 While you certainly have several options as there are numerous storage companies in El Cajon to select from, only one company - Big Box Storage - provides storage delivery and pickup right to/from your address as well as a low price guarantee. The company also provides service across East County including storage in La Mesa as well as Santee. On whatever date and time you select, Big Box Storage will deliver a storage unit straight to your El Cajon address in zip codes 92019, 92020, or 92021. Whether you live in an apartment, condo, or house, the Big Box will be placed outside the home and will fit anywhere a car might otherwise be parked. The dimensions of the unit are eight feet long, seven feet wide, and eight feet tall. A typical customer is able to fit approximately one to one and a half rooms of furniture and items within each Big Box. Although some customers only need an hour or two, there's no rush to load the Big Box once delivered. Take your time -whether it’s a day, a week, or a month. Whenever you complete the loading, a Big Box Storage staff driver will then return to retrieve the Big Box and transport it back to the company El Cajon area storage facility. Once the unit is in storage, you can access it at any point as the company is open each day of the week. There's also never a charge to access your storage. Regarding price, the services of Big Box Storage in El Cajon provide for the best value in the storage industry. Monthly rental rates start at only $64 per month. Additionally, the company provides free delivery and pickup - a savings of $99 - for customers that are storing for three months or longer. As noted above, a low price guarantee ensures you're getting the absolutely lowest rate possible. Should you find another El Cajon storage company offering a lower rate, please inform a Big Box Storage representative at 619-436-5020 and you'll then be provided with a revised rate equal to 10% less. Scheduling a Big Box delivery only takes two minutes when using the online scheduling form. Additionally, Big Box Storage staff members are readily available at 619-436-5020 to assist with scheduling a delivery or to address any other questions. Thank you for choosing Big Box Storage of El Cajon.